Sonance iPort, the mother of all docking stations | OhGizmo! By David Ponce on 03/04/05 • Leave a comment! So it seems I have to implore the Gods of Technological Benevolence forgiveness for bringing you this story while it is already one day old (gasp!). Not that I’ve been known to be the most timely gadget writer on the block, but still, I do try hard. 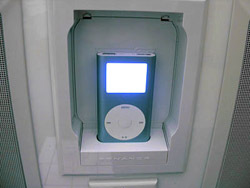 Behold Sonance’s schtick in the iPod revolution: the iPort, an in-wall docking station that’s sure to dry out your wallet, but will do it in style. And, as iPod owners surely know, style is king in the portable music business. There’s a full review of the iPort at iPodlounge. It’s replete with details of the installation process, one that will most likely require a certified electrician to be carried off without producing one or two charred bodies. Now, you have to understand. Sonance makes serious high-end audio equipment. Its clientele is upper scale. The ugly cables and boxes are all hidden away, with speakers and cabling located inside your walls, and sophisticated multi-room amplifiers hidden away in closets or other shadowed recesses. The iPort is simply a sensible extention to someone who already owns a Sonance system.